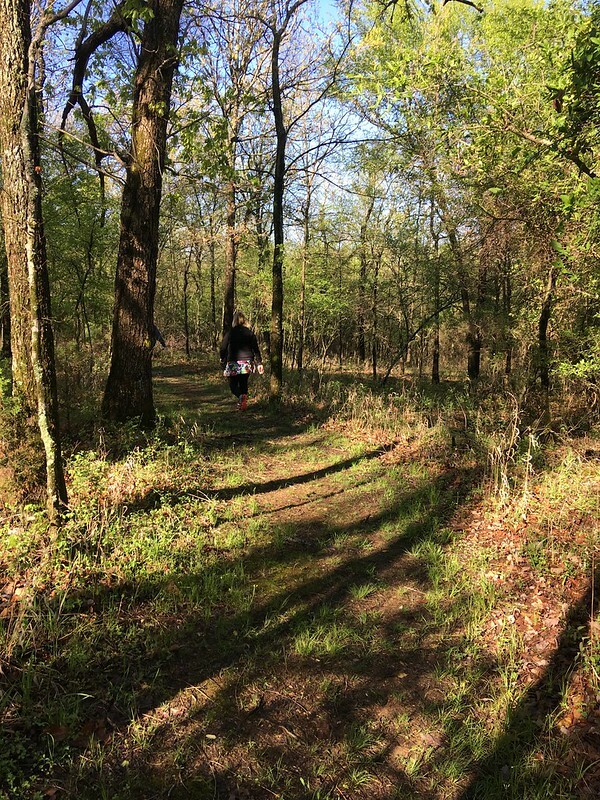 This past Sunday I drove an hour southeast of Tulsa to Oklahoma’s Sequoyah State Park to run the inaugral Sequoyah Gravel Run 10K. They also had 5K and 15K races as well and earlier had bicycling events. It had been raining the day before but Sunday it was sunny, and kind of cold and windy actually. Perfect conditions for running in other words. They sent us off and away we went. 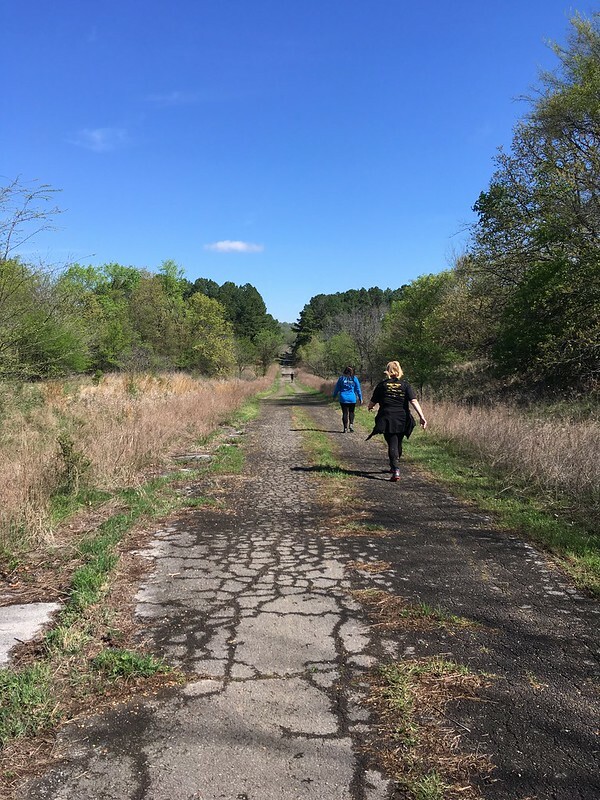 I ran with Paula and Misti. This is the third race we have run together. We all kind of go at the same pace so it works out well. There were only a few really muddy spots on the course, all easily circumvented. An environmentally conscious runner always goes right through the mud to avoid damaging the non-trail segments. And then there is me who hates running with cold wet socks. Sorry, true confessions time. 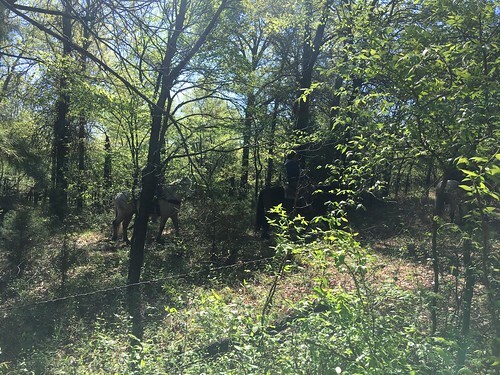 You have to look close but we came upon some riders on horses. That was cool. Another muddy spot, nope I didn’t splash through this puddle either. Sorry. And the finish line. Me in the middle, Paula to my right, Misti in the blue, a friend of theirs in yellow, and the legendary Trail Zombie, aka Ken Childress, on my far right. Ken is not only a great trail runner but a very generous and kind guy as well. He has directed so many races and helped a lot of people out in the sport. We finished third and fourth males on the race so we got to share the podium also. I give Kudos to the organizers of the race. Great trails – It had rained the whole day before but the trails were in great shape with just a few really bad puddles. (Not their fault right). 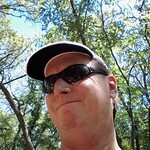 The park was beautiful and the trails in good shape. They didn’t have a ton of trail markers but they had a couple dozen people on the course making sure nobody got lost. They had a couple aid stations with plenty of supplies. Beer – Craft beer from Heirloom Rustic Ales at the end, plus a complimentary glass to put it in. That will make the sustainability people I work with swoon with delight when I tell them that. A nice touch is that everybody got a framed photo of themself at the finish. So I give the race five stars out of five. I’ll be back!! Thank you to the organizers, the sponsors, and the army of volunteers that it takes to put these events on. 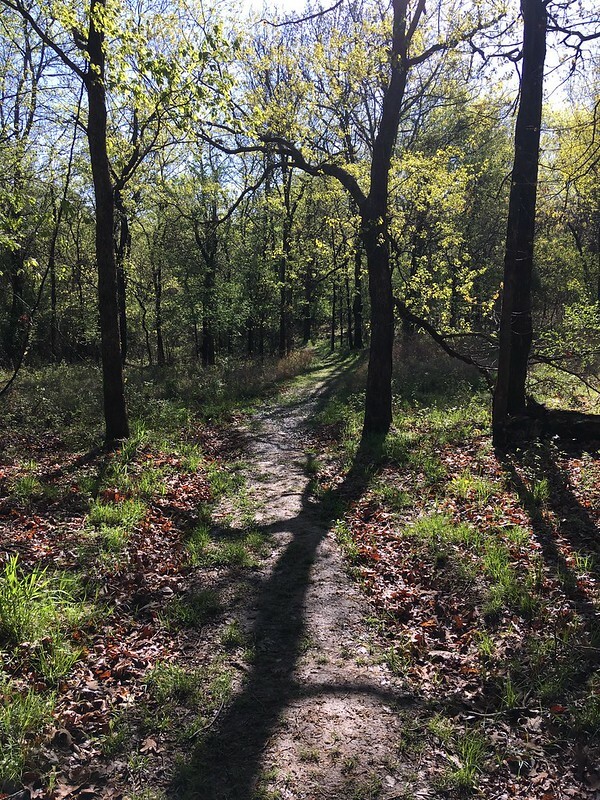 This entry was posted in Uncategorized and tagged Sequoyah Gravel Run, Skywatch Friday on April 16, 2019 by Alan Bates. How long was it take? 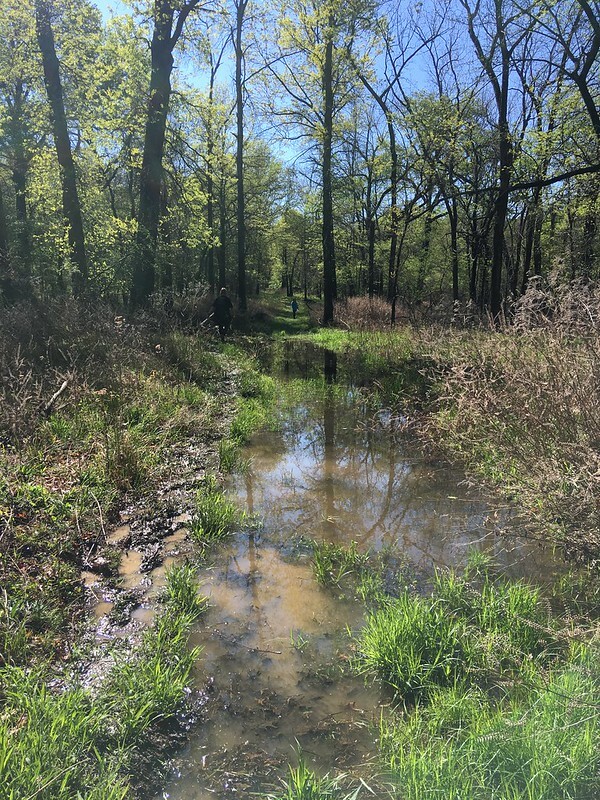 Looks like a great trail, minus the water, but that is about half of our trails right now due to all the rain we have had over the last couple months and gearing up for more in the next couple more. Have a great weekend. Hello, kudos to your running in the 10 K run. I would have to go around the muddy areas. Looks like a nice day for the event. Thanks for hosting. Happy Thursday, enjoy your day. Have a great Easter Weekend! 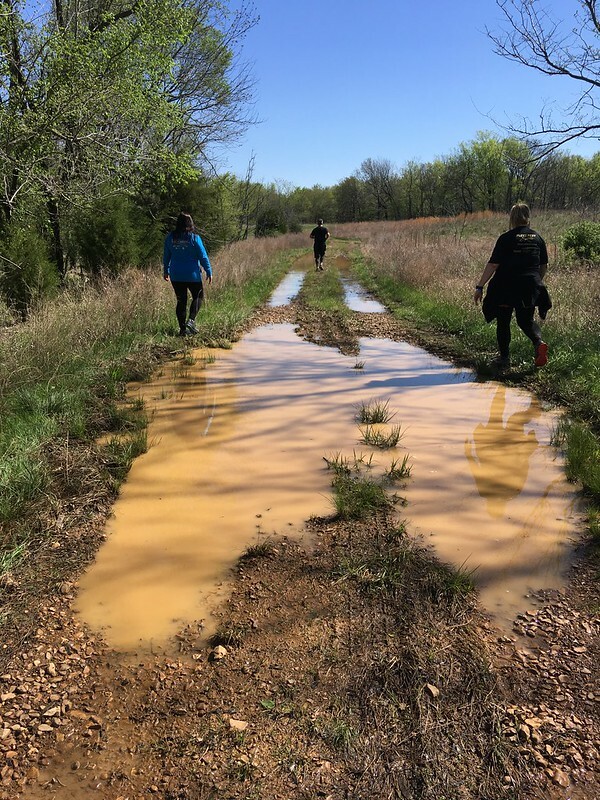 Those are ponds on the trail, not puddles! I like seeing the green – still snow covered trails here. I like that you’re still taking photos while running. Hope your knee held up. Not a fan of puddles, but looks like a fun day at the park. A beautiful place to run! (Although I’m more into strolling than running.) Congrats on your impressive finish! And craft beer to boot. Congrats on finishing the run. Look like you have nice weather there. Congratulations on the run – beautiful photos Alan. You took us on a great walk. Must always be very satisfying to complete these things. Great photos! Congratulations! I wouldn’t think of running or walking through the puddles or muddy patch. congratulations! I am not a runner but I like the idea of running such a long race with someone 🙂 like you do with these ladies. I would never run through a puddle like that. And I don’t do well on mud with my balance issues, anyway. I would pass on this one (assuming they have a walking event in the future as I don’t run) but the beer aspect would have been nice. WooHoo….you placed third and fourth on the podium. Excellent. I’m glad you didn’t get wet socks. Bravo! Happy Trails!!!! Wow, good for you Alan!! Geez, the last time I ran a 10K was probably 30 years ago! Looks like an interesting and challenging trail. I would do whatever I could to avoid cold wet socks!